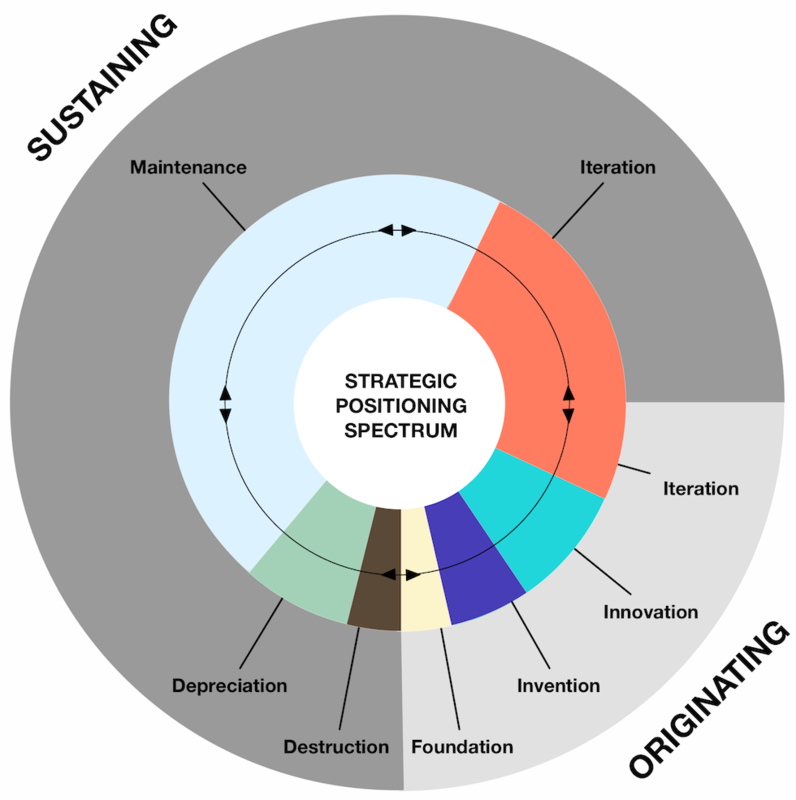 The Strategic Positioning Spectrum gives us a perspective on strategies and activities, a perspective on types of work and insight into products and services. The Spectrum helps visualize where we experience these aspects in a marketplace. It applies to activities ranging from internal practices to those that shift cultures. The Spectrum is most helpful when considering changes or innovations to a product or business. I use it as a tool in all my work including positioning and innovation audits and strategic repositioning engagements. Most day-to-day work falls into the realm of sustaining. These activities keep a business in business. Sustaining mostly involves operational effectiveness (OE) and efficiency tactics. This keeps the gears turning. Includes solving problems of operation and general day-to-day work. Nothing new happens here. Its nature and value rests in consistency. This includes updated versions or additional varieties of existing products or services. It keeps a business at pace with the progress of its market and customer expectations. This involves activities associated with closing down or sunsetting a product, service, or entire business. It can be a healthy and necessary process. It can also be a frantic attempt to sustain activities that have been left behind by a market. The opposite of Foundation, this happens when a business or practice ceases to exist or, at least, have virtually any relevance, within an marketplace. A depreciating business, product, or service will end up here if it’s not turned around. A minority of work includes originating activities. These include progress and new entries and activities that offer something that has not yet existed in the environment in question. This is where iteration crosses the line between sustaining and originating. Some iterations can be considered originating if they diverge enough from the source. Iterations like these usually progress several levels but retain many of the same activities used to maintain the established examples. Because of this, they shouldn’t be considered innovative. The hero of originating activities, Innovation often springs out of iteration practices. Though innovation results in something new and different. Full innovation isn’t really the new product. The innovation lives in the set of activities that surround and support the new product. Innovations can be built around new or established products. Exceedingly rare, authentic invention goes a step beyond innovation. Whereas innovations reside in an environment usually ready for their entry, inventions enter a risky space that must create a market for themselves. Innovations change markets; inventions change cultures. After a new market entry settles in with a strong fit of activities it can become founded, and the market accepts it as necessary. Usually, the foundation of one thing results in the depreciation and potential destruction of another. The concepts and perspectives contained in the Strategic Positioning Spectrum don’t solve problems on their own or even suggest a course of action. They do provide definition and clarity on the status and purpose of an organization’s activities. I use it as a framework to provide discussion and visibility into my clients needs.